As of today, we’re four weeks into the legislative session. It’s too early to be keeping track of that stuff. If this were a marathon, that’d be like taking a moment to note that you’d just passed the 5.24 mark. But, hey, 5.24 miles is 5.24 miles. On Thursday, I filed my proposed constitutional amendment to end the state’s deceptive practice of diverting money away from what it’s supposed to pay for – what elected officials promised it would pay for – and then using it for … whatever budget writers want to use it for. As I said in my statement, and as I’ve said over and over for years, it’s way past time to stop the debt, diversions and deception that play too big a role in Texas’ finances. My amendment – Senate Joint Resolution 24 – will start winding down the deceptive practice of collecting money for one popular purpose (parks, clean air, trauma care, etc.) and using it for something else. Better yet, we’d do it in a gradual, responsible way that won’t blow up the budget. This article has a lot of background on my work and how happy I am, after all this time, to see some of the folks who’ve fought these efforts now coming together behind them. Check it out. I’ll say it again: I deeply love Texas, and I believe Texas can do much better in showing taxpayers how the state is spending their money. Texas is facing a deep honesty deficit right now. It’s created a big hole in the budget – one so big that a responsible, candid solution won’t work if it attempts to solve the problem overnight. But it’s well past time to come up with a plan for ending diversions and taking steps to do so. SJR 24 does both. The need for an honest budget – one that accurately demonstrates the state’s needs and responsibly uses funds to meet those needs – was evident just yesterday, when State District Judge John Dietz declared that Texas’ school finance system is unconstitutional. The ruling shows that the budget is failing to meet the state’s obligations to its schools. This ruling shows we need to start working, right now, to find a permanent solution to Texas’ school funding crisis. Judge Dietz is right to recognize that those in control of the Capitol have turned their back on our most precious assets – our children – for years. His ruling supports more than 600 public school districts that felt they had no choice but to sue the state. It’s sad, honestly, that it takes something like this to force the legislature to honor its constitutional responsibility to our children. But hopefully, we’re now headed toward a better system. From its declaration of independence, one of Texas’ proudest legacies has been its commitment to schools, children and the future of the state. The truth, which this ruling makes clear, is that Texas can do much better when it comes to providing essential economic infrastructure such as schools. Those in control of the Capitol should recognize this truth and start working immediately to find a permanent solution to fund our schools. Texas kids and parents deserve a fair system that produces truly excellent schools and opportunities, not excuses or delays. That should start by reinstating the billions of dollars that were wrongly cut from school district budgets, pre-kindergarten programs, and other fundamental educational elements during the past session. Texas school children are about 100 class days into their year. The legislature has just over 100 days left in this session. We don’t have time to wait – our kids can’t afford it. Last but not least (actually, first, chronologically), Democrats in the state Senate and House of Representatives came together last week after the Governor’s State of the State speech to lay out our agenda for this legislative session. You can – and should – read our statement here. 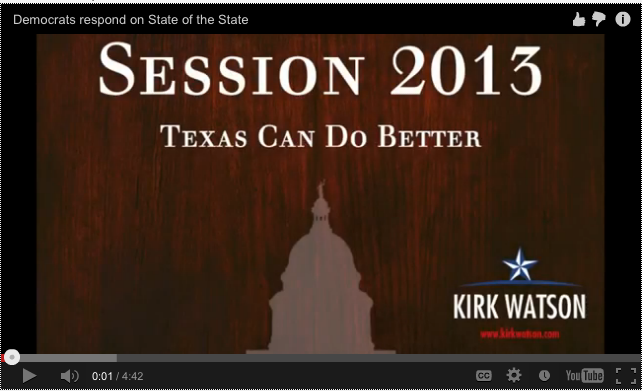 There’s also video of me answering questions on budget honesty, the importance of good health care to the Texas economy, and the best uses of state savings and resources. You should watch them all. Right now. Really, how busy can you be – there can’t possibly be that much going on so early in the session. Right?